Good morning! I am so excited for today - lots to do but it's supposed to be 81 here. Considering it was in the 50's a couple days ago, that's something! 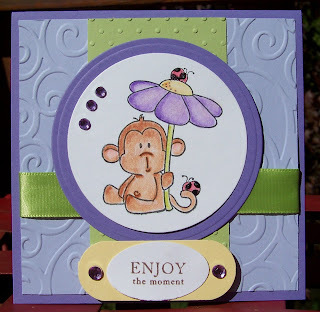 I was so excited to play with this little monkey - he's from the Paper Jewels store - from CC Designs. He's from the Flower Power as part of a set of 3. The rhinestones are Kaisercraft, you can find them in the Paper Jewels store too:) I colored him in with Prismacolor pencils. I also used the sketch from Sweet Sketch Wednesday for this card. What a sweet image and I love your embossing! Thanks for playing at SSW! I think I'm seeing double. I just commented on this. LOL. Very cute! Makes me smile! Thanks so much for joining us at Sweet Sketch Wednesday! oh easier to say everything! Thanks for joining us at SSW! Oh my gosh!!! What a wonderful creation!!! Thanks so very much for joining us at SSW and good luck! This is sooo cute Colleen! I love the embossed background & your embellishments add a great sparkle. Hugs! Pretty Pretty Purples. I love that little iamge! So cute! Thanks for playing along at SSW~! how adorable! great colouring and I like how you layered the punches for the sentiment. Oh so sweet! Love that little image and the purple and green together! Thanks so much for playing at SSW. Fab colours, really nice card. Thanks for playing at SSW! Awww, love the image and the embossed background! Such a sweet image! Good color combo too! Nice, nice, nice! Ahhhh...that monkey is soooo cute!